The Willet line of whiskeys are a hardy bunch. By that I mean when I drink them my throat feels like hot oil is being poured down it. Not a bad thing mind you, just one of those types of booze that I have to remember that fact about. Now, some of you might ‘tsk me about this, especially since Willet isn’t cheap, but you know what? I will use it as a base sometimes. Look, I enjoy my whiskeys neat, but sometimes I taste something and I think to myself, this would go well with X. And in this case, a couple ounces of Willet go well with the cherry syrup I made last week. And all those lonely cherries that were left behind. 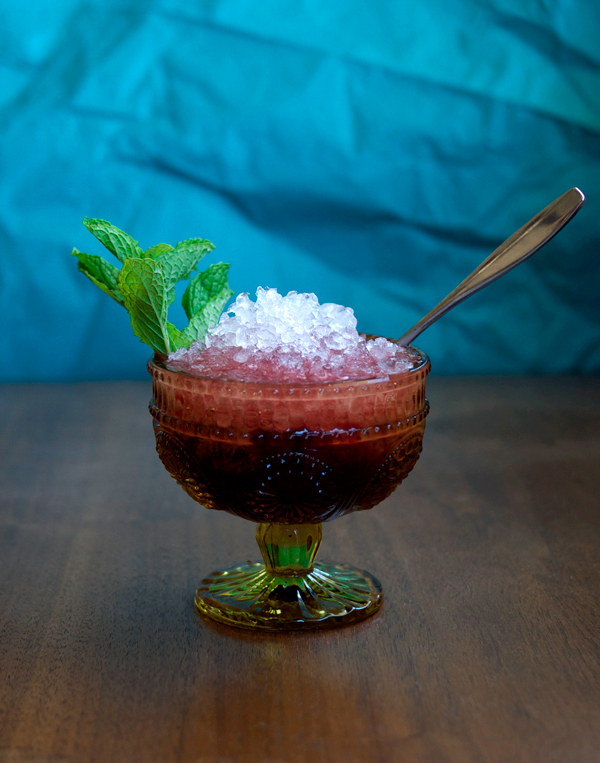 When I started reading about cocktails and really starting delving deeper into their history, I came across the concept of ‘cobblers’. Not the dessert, but a drink in which you decorate a mound of ice with booze and fruit among other things. Kinda like a tarted up adult sno-cone. I loved the idea of these ‘beverages’; they seemed so old fashioned to me. I have been making notes for almost 2 years now on doing this, but just never got around to it. Until now. After making that cherry syrup I found that I had a bag of sugary, smooshed cherries that needed some love. So I decided now was the time to start tinkering with cobblers. I’m marking this post as a good starting place, but already I’ve thought of some ways to improve upon it. Here’s a big tip: don’t go too fine with the ice. 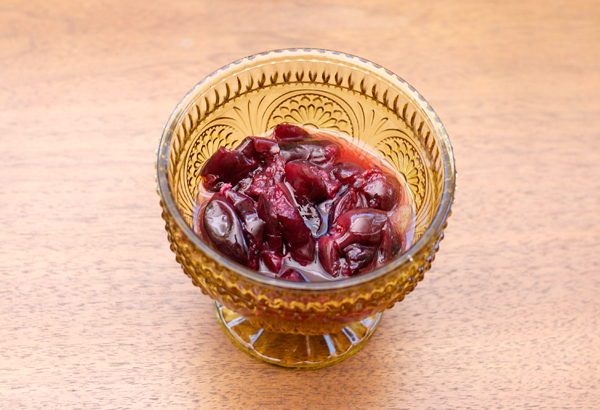 It melts too quick and you find all your cherries and liquid will start quickly plopping over the side of your dish. For presentation’s sake I made this in a shallow dish, thinking that I could mound the cherries on top, however, they all sank due to my ice crusher’s overzealous attempts to pulverize the ice and thus resulting in quickly melting ice. You would be better off to pile the ice in a collins glass and stick the fruit on top. Also, go easy with the ice! Too much and it waters your drink down too quickly. If you follow those guidelines you’ll be on your way to enjoying this summery, refreshing cocktail. So, grab a spoon and a straw and let’s get started. 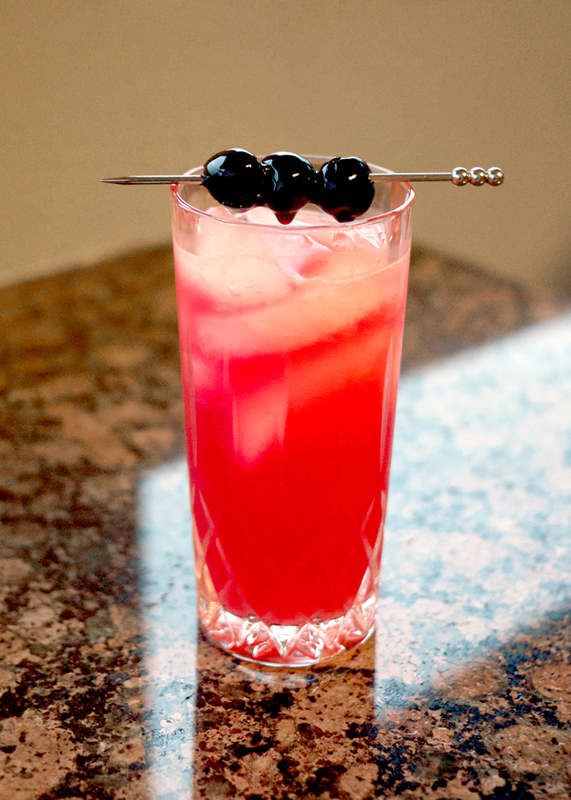 In a shallow dish, place the cherries in the bottom (if using a Collins glass, reserve for the end). Mix whiskey and syrup with half of the crushed ice gently to combine. Pour into dish. Pack more ice on top. 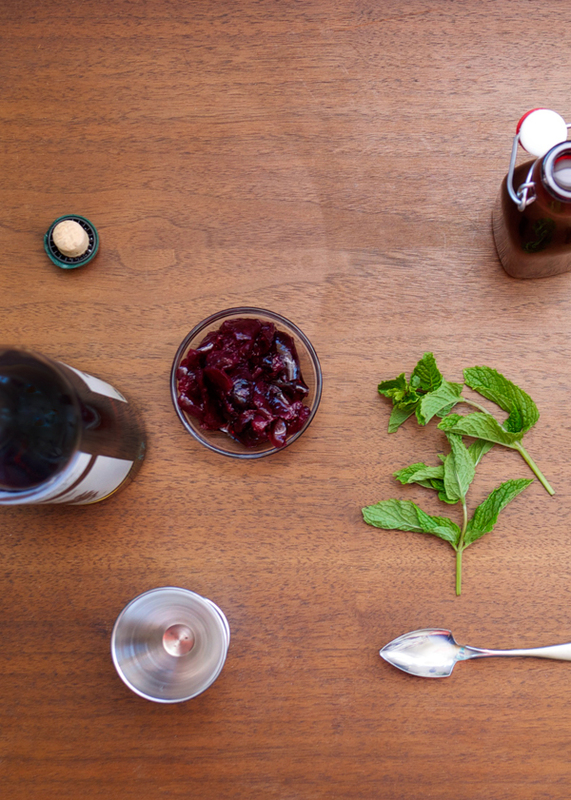 Slap your mint to release the oil and garnish the drink. Grate fresh cinnamon on top. Now, here’s the fun thing about the cobbler: do you eat the fruit first? 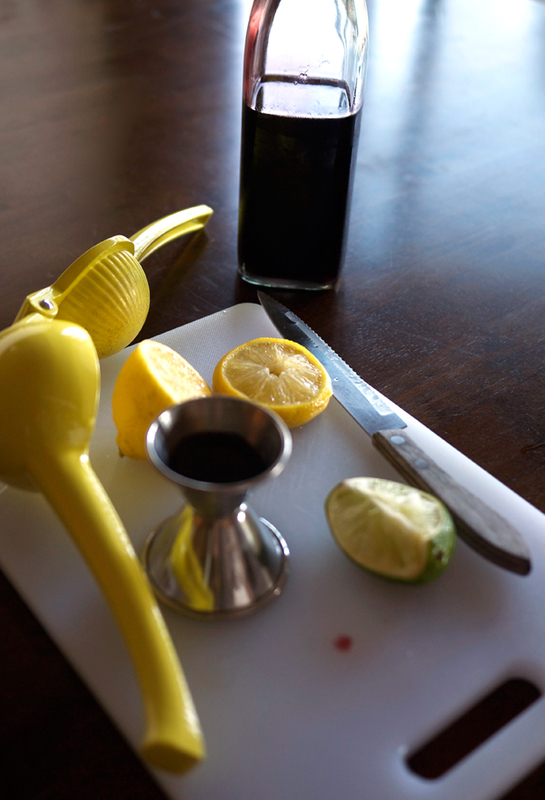 Or do you stick your straw in (go to the very bottom where the syrup, juice and whiskey have collected) and drink up? Your choice. You can even alternate if you’re not a weirdo like me and need to choose one or the other (I was that kid who only ate one food group at a time off their plate and never combined anything, occasionally this annoying trait finds its way back into my life once in a blue moon). Enjoying this cocktail is like having a more subtle version of an icee, with alcohol. 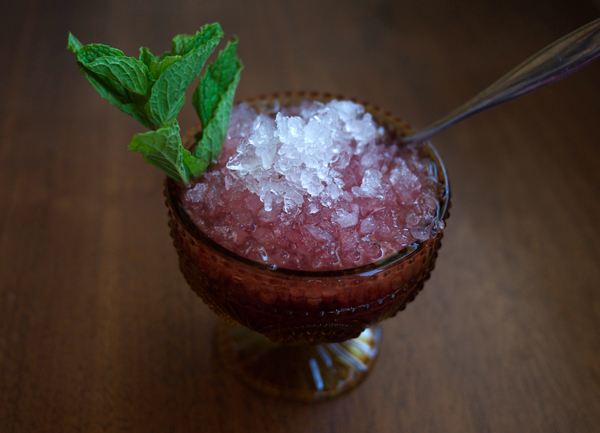 The ice tones down the heat of the whiskey and it mixes with the cherries for a sweet and lightly spiced flavor combo. This is not your convenience store cherry flavor mind you. Don’t go in thinking it’s like that or you’ll be disappointed. It’s a fresh cherry flavor, and in a way more muted. This has been enjoyed with the extreme heat we’ve been having this summer, and this has helped cool me down, sans the uber-sugary fake flavor you’d find elsewhere. Next time though I think I’ll pre-make a snowball with a hole in it to keep the ice-melting at bay.